I was walking in the city the other day when I saw a reflection of a middle aged man who was wearing familiar clothes in a shop window and he seemed to be looking at me. I stopped and he also stopped. It was only then that I realized that I was looking at my own reflection. But I looked much older than I felt! This is true for most people, they do not realize that age is catching up with them. Today, we look at the reasons why we should get serious about preparing for retirement. Please CLICK HERE to watch on You Tube. Time goes so fast that some people are caught unaware that life has caught up with them. They have been so busy taking care of their families that they have forgotten to prepare for their own future especially when they become too old to work. Every person should prepare so that when that time comes, they can have the choice of working for the love of it or relaxing and enjoying the fruits of their labor. People who have spent their fruitful years working and supporting their families should have a chance to lay back, do what they have long wanted to do and live life to the fullest without worrying about financial support. Not everyone has the opportunity to enjoy retirement without any worry about their finances. 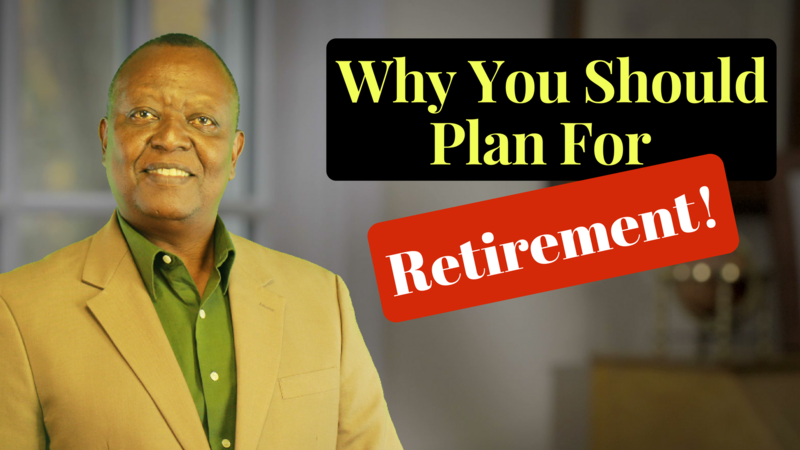 People who want to enjoy their retirement without all the worries should begin preparing early, when they are still able to work hard and earn an income. Please CLICK HERE to watch on You Tube. Planning for your own retirement should be treated the same way when planning to invest in a house or a car. Every person should set aside some amount from his monthly earnings, to be invested and used for his retirement. If you are contributing to a pension plan, that is a good start but do not be lulled into a false sense of security. Most pension plans provide only 30 to 35% of pre-retirement income and is therefore not adequate to maintain pre-retirement standard of living. A comfortable retirement usually rests on three legs; an occupational pension scheme, government pension scheme and one’s private investments. Please CLICK HERE to watch on You Tube. Start planning for your retirement and look forward to a life worth living after you are out of the daily grind. Thank you for watching and have a lovely week! Please CLICK HERE to watch on You Tube.